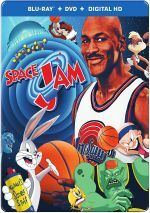 Michael Jordan agrees to help the Looney Tunes play a basketball game vs. alien slavers to determine their freedom. $27.528 million on 2650 screens. When Space Jam hit screens in late 1996, it sounded more like a marketer’s dream than an actual movie. The flick paired Michael Jordan, the world’s most popular athlete fresh off his fourth NBA championship, with Bugs Bunny and a parade of other characters from the classic Warner Bros. cartoons. How could it fail? Financially, Space Jam failed to fail, but it also failed to approach expectations. 20 years later, I still recall all the hype that surrounded the film, as the folks at Warner Bros. clearly anticipated a stunning hit. Jam eventually nabbed $90 million at the box office, a figure that seemed passable but very ordinary. It ensured that no one could view Jam as a bomb, but no one could regard it as a real hit, either. Given that $90 million only placed it 18th among the year’s top grossing flicks, the take had to be a disappointment. Did the quality of the flick itself disappoint anyone? Probably, though I can’t imagine many expected much from this melding of animation and live-action footage. Jam opens in 1973 with a quick prologue that shows a 10-year-old Michael (Brandon Hammond) as he practices his shot and tells his dad (Thom Barry) of his aspirations. The movie then offers a quick Jordan highlight reel before we arrive upon almost current day to see the press conference at which Jordan announced his retirement from basketball and his decision to play baseball. While we see Jordan’s frustrations as a member of the minor league Birmingham Barons, we also go to an alien planet to visit the Moron Mountain amusement park. Its leader Swackhammer (voiced by Danny De Vito) feels frustrated as he loses customers because of the site’s lack of exciting attractions. He decides he needs something “looney” so he conspires to kidnap the classic Warner Bros. cartoon characters. The aliens fly to the Looney Tunes realm in the center of the Earth and try to kidnap Bugs Bunny (voiced by Billy West) and the others. They succeed, except Bugs tricks them into agreeing to giving the Tunes a chance to defend themselves. Given the aliens’ small size and slowness, Bugs chooses basketball as the venue. However, the aliens have tricks of their own up their sleeves. They kidnap the talent of NBA stars Charles Barkley, Patrick Ewing, Muggsy Bogues, Larry Johnson, and Shawn Bradley. When they unleash these powers, the aliens mutate into enormous “monsters” who can easily dominate the Looney Tunes. Bugs then decides to kidnap Jordan to play for their side. Initially Michael refuses, but when the Monstars mock him, he decides to work for the Looneys. All of this leads to a massive contest that will settle all the questions. Essentially the “story” feels like little more than a long build-up for that big game. Obviously, the plot of Space Jam seems minimal and exists just to give us an excuse to get to the film’s major sequence. With all that anticipation, does the battle between the Tunes and the Monstars live up to expectations? Not really, but it seems moderately enjoyable. That sentiment applies to pretty much all of Jam. To be sure, the movie fails to turn into the disaster I thought it might be. However, it never remotely starts to develop all of the situation’s possibilities. One can see all of Space Jam encapsulated in Jordan’s performance. As an actor, Jordan fails to stand out from the crowd, but he also makes sure that he doesn’t embarrass himself. It’s mildly amusing to see the film lampoon Jordan’s ill-fated baseball aspirations, and the athlete shows a nice ability to laugh at his own expense, but none of these moments seem terribly clever or inventive. They feel funny more because we’re surprised to see Jordan allow the filmmakers to mock his attempts to play baseball than because of any real humor created. Unsurprisingly, the movie’s best moments come from Bill Murray’s cameos, especially when he interacts with another guest, Larry Bird. The former Celtic can’t act at all, but he displays a laconic charm that plays off of Murray’s broadness. They’re quite amusing together and provide some fun elements. Otherwise, much of Space Jam seems enjoyable in a moderate way, but it never really comes to life. It tries to entertain both adults and kids but doesn’t quite satisfy either audience terribly well. Some fun moments occur and the concept remains cool, but the whole feels like less than the sum of its parts. Space Jam appears in an aspect ratio of approximately 1.85:1 on this Blu-ray Disc. This was a very good presentation. Nonetheless, the vast majority of the movie provided good to great delineation. I noticed no examples of jagged edges or shimmering, and edge enhancement also appeared absent. Print flaws weren’t a factor, as the movie always looked clean. As one might expect, Jam came with a broad palette, and the hues looked lively and full. Blacks appeared dark and tight, while shadows were smooth and clear. The image held up well. I also felt impressed with the DTS-HD MA 5.1 soundtrack of Space Jam. Actually, while I mostly liked the audio, the soundfield offered a mild disappointment. With the wild and zany universe at play here, I thought the mix would take better advantage of the multi-channel options than it did. The audio remained oriented toward the front speakers. Within that domain, the soundfield seemed well executed. Elements were appropriately placed and meshed together neatly. Music also showed good stereo imaging. As for the rear channels, they added some decent reinforcement to the setting, but they lacked the pizzazz I expected. A few sequences – like one with Wile E. Coyote – zoomed around the back nicely, but those scenes occurred fairly infrequently. The somewhat restricted scope of the mix was the only reason it didn’t hit “A” level, for the audio quality seemed terrific. Speech was consistently natural and distinctive, and I noticed no issues connected to edginess or intelligibility. Effects sounded concise and accurate. They presented solid dimensionality, with clean highs and deep lows. Music fared especially well, as the score and songs were lively and dynamic. Expect this one to pump your subwoofer actively, as Space Jam offered a generally satisfying soundtrack. How did this 2016 "20th Anniversary Steelbook" compare to the original Blu-ray from 2011? Both are literally identical - the 2016 release simply repackages the 2011 version. Obviously this means both Blu-rays share the same extras, and we get an audio commentary from director Joe Pytka plus Bugs Bunny and Daffy Duck. A holdover from the 2000 single-disc special edition, this track mainly features two folks not directly mentioned on the packaging: voice artists Billy West and Dee Bradley Baker. The performers behind Bugs and Daffy, they speak both in character and as themselves. In the latter form, they offer the majority of the commentary. Sometimes they just praise the movie and relate the names of other performers, but they also shed some light on the voice acting process and add an interesting perspective. Their material as Bugs and Daffy pops up fairly infrequently and consists of wry comments about their work and the movie. It’s not exactly a laugh riot, but it’s reasonably entertaining. As for Pytka, he shows up sporadically. The commentary offers an odd conceit as part of its construction. While West/Bugs and Baker/Daffy provided a running, screen-specific discussion, Pytka’s parts were clearly recorded separately and edited into the piece. To create the illusion that he participated with the others, before Pytka speaks, we hear a door open and the sound of footsteps. When he finishes, the footsteps walk away and the door closes. This shouldn’t fool anyone. I read a few other reviews that claimed Pytka said almost nothing during this commentary, but that’s not accurate. No, he doesn’t remark frequently, but he shows up regularly and adds some decent information. Among other topics, Pytka discusses how he got onto the project, his relationship with Michael Jordan, dealing with technical issues, and amassing the music soundtrack. When Pytka talks, his statements seem informative and educational. Overall, the commentary has some good moments, but it suffers from way too many gaps, as a lot of empty space mars this presentation. Next we go to a documentary called Jammin’ With Bugs Bunny and Michael Jordan. Created at the time of the film’s theatrical release, the 22-minute, 32-second show mixes movie clips, behind the scenes materials, and interviews. We hear from Michael Jordan, director Pytka, executive producer Ivan Reitman, actors Danny De Vito and Wayne Knight, animator Chuck Jones, animation producer Ron Tippe, composer James Newton Howard, and Cinesite CEO Ed Jones. We learn a little about the production and get some decent glimpses of the creation of the effects. However, the tone remains overwhelmingly promotional, as “Jammin’” exists solely to tell us how wonderful the movie is. This means the result seems generally uninformative and lacks much to make it worth a watch. In addition to the film’s trailer, we get two music videos. These include Seal’s “Fly Like an Eagle” and the Monstars Anthem “Hit ‘Em High”. The Seal clip mixes lip-synching with movie snippets and shots of MJ and others as they shoot hoops. The song’s a decent update of the Steve Miller hit, but the video seems dull. “Hit ‘Em High” uses the same lip-synch/movie segment format, but the song is much more annoying. What does the Blu-ray lose from the 2003 DVD? 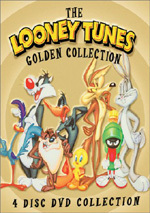 It drops four animated shorts and a compilation of musical moments from various Bugs and/or Daffy cartoons. The 2016 Blu-ray package includes a DVD copy of Space Jam. This duplicates the 2003 DVD - but since it lacks that release's second platter, it fails to provide those bonus materials I mentioned in the prior paragraph. Neither an embarrassment nor a treasure, Space Jam occasionally provides some entertaining moments, and it largely maintains the viewer’s interest throughout its brief running time. However, it never grabs the audience’s attention strongly, and it fails to remotely approach to live up to its potential. The Blu-ray presents very good picture and audio along with a smattering of decent supplements. 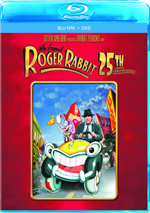 The movie’s nothing special, and this 2016 Blu-ray simply reissues the movie's 2011 release.